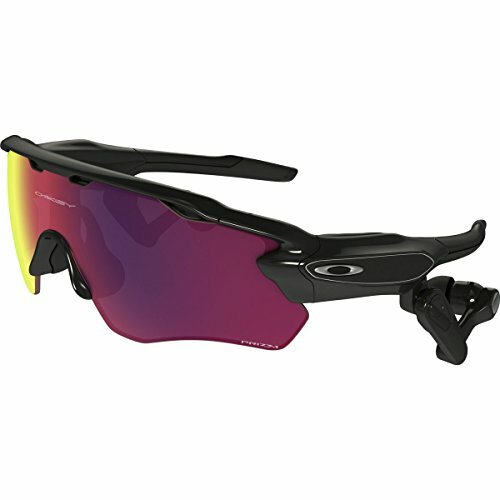 Maximize your performance with the latest technological advancement offered by Oakley. Radar Pace Prizm Road Sunglasses were developed after years of research and development and a strategic partnership with Intel. The result is a durable pair of smart glasses that collects, monitors, and analyzes personal health data and adjusts workout programs for peak efficiency and optimal performance. A perfect solution for the performance-minded athlete, Oakley's Radar Pace Prizm Road Sunglasses collect and analyze your performance data during physical activity. Oakley smart glasses monitor heart rate, speed, cadence, power output, distance, and time to optimize your performance. Utilizing Intel technology, these lightweight yet durable Oakley smart glasses monitor performance on the fly and adjust your training zones as you improve. This provides personalized coaching that can adapt to your individual abilities and delivers a performance edge over the competition. The Radar Pace Prizm Road Sunglasses by Oakley analyze data from multiple internal sensors and can pair with other workout sensor-equipment that utilizes Bluetooth or ANT+ technology. Oakley has incorporated a dynamic adjustment platform that automatically factors in missed workouts to create an efficient program that will allow you to achieve your overall goals. The Oakley Radar Pace utilizes durable frames and lenses that are coated with 100% UV protection. These glasses are equipped with Oakley PRIZM lens technology and measure 137 mm for the lens and bridge and 132 mm for the arms. Your purchase includes a protective case and (1) Lithium ion battery, which is required to power this product. COLLECTS & ANALYZES DATA: A perfect solution for the performance-minded athlete, Oakley's Radar Pace Prizm Road Sunglasses collect and analyze your performance data during physical activity. Monitor heart rate, speed, cadence, power output, distance, and time to optimize your performance. CALIBRATES TO MAXIMIZE INDIVIDUAL PERFORMANCE: Utilizing Intel® technology, these Oakley® smart glasses monitor your performance and adjust your training zones as you improve. This provides personalized coaching that can adapt to your individual abilities. OPTIMIZED SENSOR TRACKING: Radar Pace Prizm Road Sunglasses by Oakley® analyze data from multiple internal sensors and can pair with other workout sensor equipment that utilizes Bluetooth® or ANT+TM technology. DYNAMIC ADJUSTMENT: Oakley® has incorporated a dynamic adjustment platform that automatically factors in missed workouts to create an efficient program that will allow you to achieve your overall goals. OAKLEY PRIZMTM LENS TECHNOLOGY: Oakley PrizmTM lens technology has turned eyewear into vital equipment for sports. PRIZMTM lenses enhance your vision in both bright light and shadows, helping athletes spot changes in the texture of the road surfaces, react faster and perform at their best.